Our Li Hing Mui Gummie Bears are mixed right here in our kitchen! 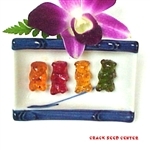 We've taken gummy bears and steeped them in our special li hing mui sauce and sprinkled in some li hing mui powder. Our Li Hing Gummie Bears are moist, soft, and chewy. Any li hing mui lover will enjoy this local favorite! If you have a sweet tooth, also try our Li Hing Sour Candies (Li Hing Sour Patch Kids, Li Hing Sour Apple, Li Hing Sour Watermelon, Li Hing Gummie Frogs, Li Hing Peach O's and Li Hing Apple O's).